Somewhere on the alternate trail….. It rained last night. Dramatically. With flashy stobelight lightning. I was up early and in the lodge restaurant for some Creme Brûlée French toast and really fine coffee. The restaurant was fancy. I felt like a troll with my dirty fingernails and greasy hair. The view of Crater Lake was completely hidden behind a wall of fog. C﻿ould be a problem because I forgot to take pictures yesterday. It’s too bad I couldn’t get a wash yesterday. There’s so much dried snot on my sleeves, I haven’t got clean spot to wipe my nose on. 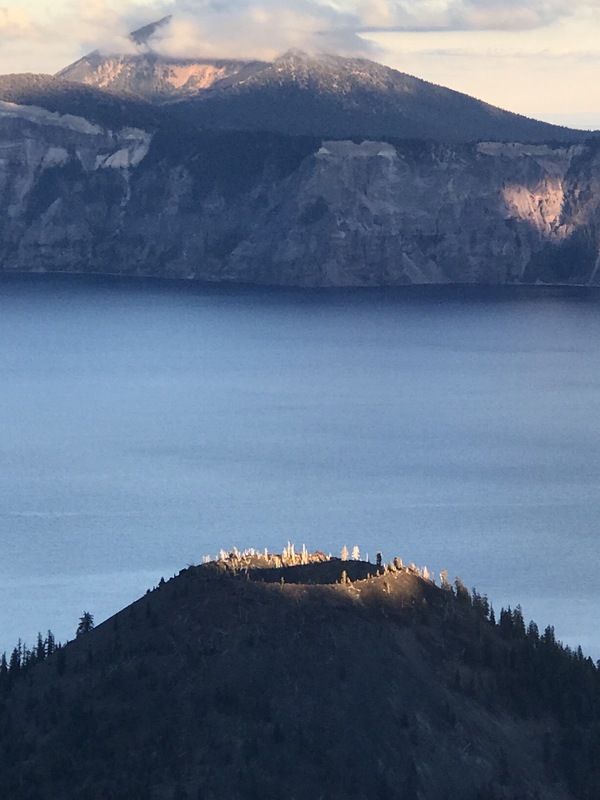 Walking the Rim Trail, I can’t help but wonder how many people have fallen off the edge at Crater Lake? Have any murders happened here? It looks like a place where someone might arrange an accidental fall to collect insurance. Probably I’m listening to too many truecrime podcasts. I overheard some guy say he jumped in the lake because it was “the opportunity of a lifetime.” Opportunity for what, to get really cold? But also, where? There must be a way to get down there. And back up. 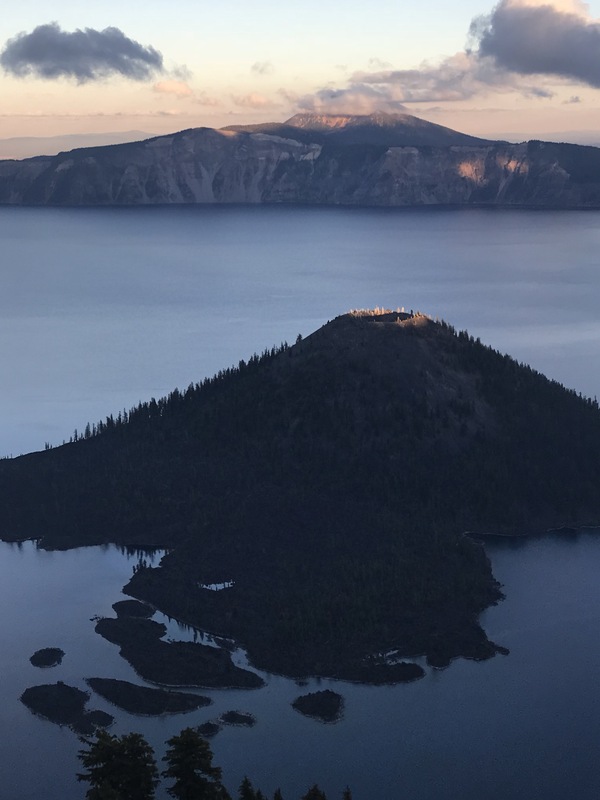 One of the info signs says you can take a boat to the island/baby volcano in the caldera during the summer. You can hike up to the crater of a volcano that’s inside a crater inside a volcano. It’s called Wizard Island. Maybe the Oregon version of Hogwarts is inside. They practice the dank magic. I talked to some old people and their dogs. They all knew about PCT but they all called it something else. Pacific Coast Trail. Pacific Rim Trail. That one would be so epic, right? A trail along the whole Pacific rim. I’d rather ride my bike for that one. 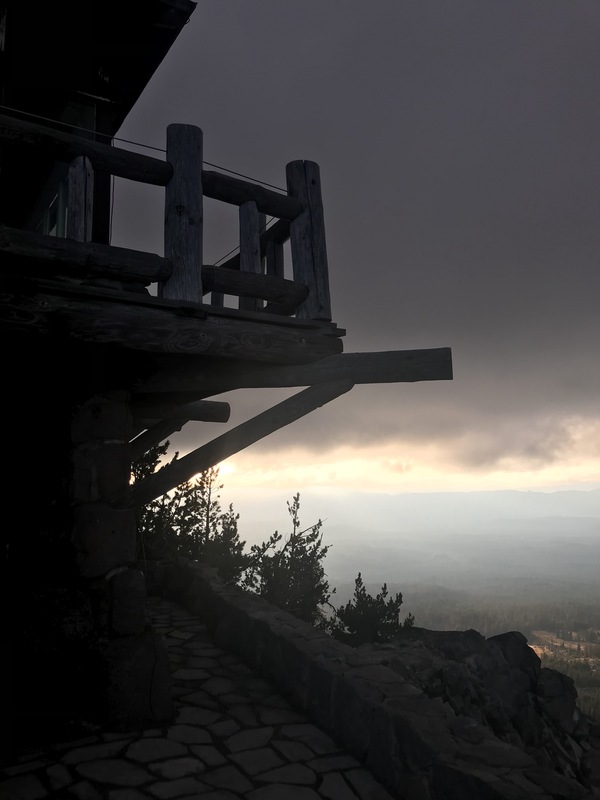 I hiked up to an observatory that’s also a fire watch tower. Staying in a fire watch tower has been one of my weird life fantasies for decades. One of these days. Not at Crater Lake because it was all locked up. And there were some dudes there… hanging out, not talking, wtf? Definite strange-o vibe. Once again, camping on the Rim Trail is forbidden so I definitely for sure didn’t do that.